The mother of two young daughters, Dr. Chung knows the importance of making the dental experience fun and painless for both children and adults. A graduate of the UCLA School of Dentistry, she has received numerous awards for outstanding performance, including ones from the American Academy of Implant Dentistry and the American College of Prosthodontics, and was asked to join the Omicron Kappa Upsilon Dental Honor Fraternity--one of the highest honors awarded to dentists. She is a standing member of the American Dental Association, the California Dental Association, the West Los Angeles Dental Society, and the Punjabi Dental Society, and constantly updates her skills with hundreds of hours of post-graduate training in all aspects of oral care. 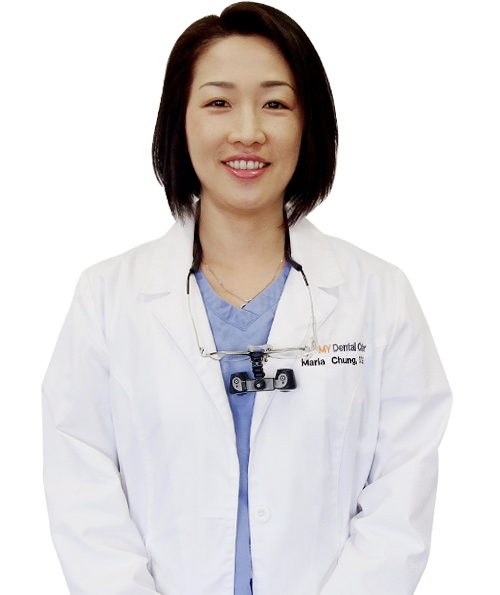 In addition to speaking English, Dr. Chung has a native proficiency in both Korean and Spanish. Away from the practice, she enjoys watching movies and traveling with her family. My Dental Center provides the advanced dental and oral surgical care. Our entire staff is dedicated to providing a warm and caring environment from your initial visit throughout the entire healing process. We provide General, Pediatric and Cosmetic Dentistry, Implant, and Orthodontics services. At the My Dental Center, we strive to offer sound advice, combined with the best dental and oral surgical care. Our goal is to provide you with a pain-free, healthy mouth throughout for the entire families.